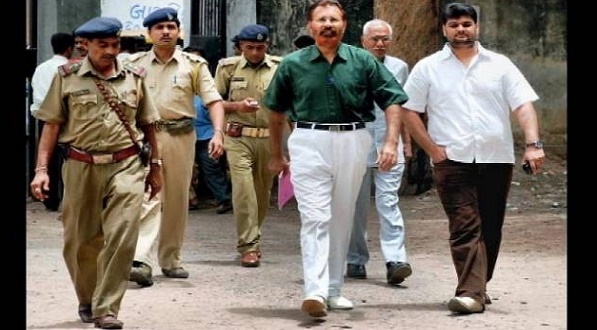 AHMEDABAD – Retired deputy inspector general of police DG Vanzara, who was granted bail in the Ishrat Jahan fake encounter case by a special court in the city recently, will finally be released from custody on Wednesday. The delay in his release was caused due to another bail granted to him in Sohrabuddin Sheikh encounter case by a Mumbai court. Vanzara was granted bail in the case on February 5, but could not be released immediately. In September 2014, the Bombay high court had also granted him bail in the Sohrabuddin case. This bail had not been executed. Hence, last week, his lawyers first prepared the process for executing the bail order in Mumbai, which delayed his release. Vanzara had been in custody for nearly 8 years when the special Central Bureau of Investigation court here granted him bail. So who is Vanzara really? Known to be close to then Gujarat Chief Minister Narendra Modi, Vanzara’s career graph shot up in the early 2000s. The 1987 batch IPS officer was famous as an encounter specialist from his days as the head of Crime Branch and few would have thought that the “encounter” of a small-time Madhya Pradesh criminal would not only bring on his downfall, but that of men more powerful than him. Sohrabuddin Sheikh and his wife Kausar Bi were taken off a bus in November 2005 by members of the Gujarat Anti-Terrorist Squad (ATS) and other policemen, and were taken to a farmhouse near Ahmedabad, where they were held hostage. A few days later, Sohrabuddin was allegedly taken to a highway and shot dead. Kausarbi disappeared. Vanzara was the head of Gujarat’s Anti-Terrorist Squad at the time, leading a team of encounter specialists. From 2002 on, Vanzara had had many such “encounters” to his credit. Each time he described the people killed as terrorists out to kill Modi. After the Sohrabuddin killing Vanzara held a Press conference and said the man killed had been a Lashkar-e-Toiba terrorist and was plotting to assassinate Modi. A year before Sheikh was killed, in June 2004, the 19-year-old student Ishrat Jahan was shot dead along with three other people on the outskirts of Ahmedabad in June 2004. Her mother said Ishrat was the victim of a “fake encounter”. The police said she was a Lashkar-e-Toiba operative. Vanzara was the Deputy Commissioner of Police, Ahmedabad. After Vanzara’s arrest, other similar dubious killings came to light. There was one Samir Khan, killed in Usmanpura, Ahmedabad in 2002. Sadik Jamal of Bhavnagar, killed in 2003 and whose parents insist it was a fake encounter. In December 2006, Tulsi Prajapati, said to be an accomplice of Sohrabuddin and a police informer, was also killed in an encounter in Gujarat’s Banaskantha district. Prajapati was said to be a witness in the Sohrabuddin case. Days before Prajapati was killed, Vanzara was transferred to the Border Range Police, which has jurisdiction over Banaskantha district where Prajapati was killed. Vanzara was the Deputy Inspector General of Gujarat Police, Border Range, when he was arrested a few months later, but his closeness to Modi made him the most powerful cop in the state. The news of his arrest was greeted with disbelief everywhere. Vanzara was arrested in April 2007 by the Gujarat Crime Investigation Department (CID). The CID sought court permission to conduct a narco-analysis test on Vanzara. The suspended cop pleaded in court that he had a heart ailment and his lawyer argued that chemicals injected would adversely affect his health. During his early days in jail, Vanzara had been quoted as saying that he could not read newspapers or watch television, but was motivated by the discourses of a guru, Asaram Bapu. Vanzara even said he was doing yoga prescribed by the guru. By then, the CID had begun excavations at Vanzara’s farmhouse in Ilol village in Gujarat’s Sabarkantha district. The CID suspected that Sohrabuddin’s wife, Kausar Bi had been poisoned and then taken to Vanzara’s village and was burnt there. They later searched ravines near Ilol too, but Kausarbi’s body was never found. Two years later, in 2008, there were reports that Vanzara and another cop arrested in the Sohrabuddin case, NK Amin, had attacked each other with cricket bats at the Sabarmati jail. Jail inmates were quoted as saying that Amin accused Vanazara of being responsible for them being in jail. Amin has recently said he would like to turn approver in the case.